It appears as though the long-tail effect has taken hold in music venue design. Where once the multipurpose venue dominated, market demand for specific cultural experiences correlating with niche genres is propelling a new trend toward smaller, technologically advanced musical performance venues. National Sawdust is an example of a venue purpose-built for a specific niche of music programming. Shown here is the performance room at the venue in Brooklyn, NY. There are a bevy of economic factors playing in to the slight pause on 3,000-seat venue development, but the cultural attributes to the trend underscore a technological renaissance among artists and venue operators. Good sound and acoustics are the baseline, but these rooms are also densely wired for video, lighting, and routing of all of the above. More musicians are entering a space with knowledge of various audiovisual tools and an expectation that they will be able to create an immersive aesthetic for their audience. “Art has become so diversified, and the audiences are more distributed—maybe the rise in smaller venues is a result of that,” observed Paul Chavez, director of systems operations, Harman. Listing by example an unprecedented number of new 800-to 1,000-seat venues in his Los Angeles locale, Chavez pointed to the Regent Theater, Teagram Ballroom, and the upcoming Frank Gehry creation, the Jazz Bakery, in addition to new performance spaces likely to be added to the renovated Los Angeles County Museum of Art. 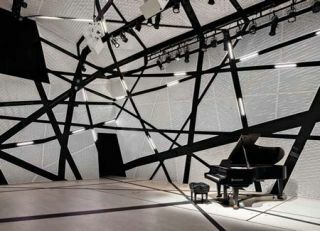 The National Sawdust arts center is a former factory in the Brooklyn neighborhood of Williamsburg and includes a modern take on the black box theater design. The recent spate of new venues is a continuation of a trend originating in the legendary IRCAM space opened in 1977 at Le Centre Pompidou in Paris, which offered variable acoustics via moving walls and ceiling panels. Los Angeles’ RedCat Theater is an echo of that flexible art space, and the upcoming White Box Space under construction at the San Francisco Museum of Modern Art, will also present a flexible ceiling, movable podia, and seating with an equally deft audiovisual design by Arup. Heading eastward across the country to another Arup project, The Cube at Virginia Tech presents high-ceilinged room with lofty audiovisual aspirations, with 3D audio produced by a 145-loudspeaker setup and an immersive video equivalent soon to arrive as well. The room is the embodiment of immersive performance and inter-disciplinary collaboration. See here for an example today of what tomorrow’s CEOs, engineers, scientists, and educators will want in their atriums, auditoriums, and maybe even gymnatoriums. We built this crazy new immersive technology, and now people want to use it. Arup has its hands in yet another grand venue built on a small scale, one that most astutely demonstrates the high density of intelligence built into modern iterations of the black box theater concept. Doing that extremely hip, contemporary-cultural thing and transforming a former factory into an arts venue, National Sawdust (you can guess what used to be manufactured there) did a lot more than hang a few speakers from the rafters and call it done. A collaborative design process that began in earnest between the not-for-profit organization, its architect of choice, Bureau V, and their acoustical and audiovisual design firm of choice, Arup, produced after six years a small, cubicle venue that seats just over 100 and accommodates 350 or so standing. The entrance to National Sawdust, a factory-turned-art center in NYC. The room itself is a jewel encased in black stone, so those who walk in to the venue wander through a dark hall and watch a gigantic obsidian-like sliding door rise to create an entrance to an entirely white room. The acoustically transparent wall panels provide a geometric filigree, “presenting an ornamental program to the space,” as Bureau V’s Peter Zuspan described. The whole experience of the entry and the room itself, which enables plenty of lighting and projection tricks on all the white surfaces, was built for immersion into the atmosphere of the creatively challenging artists who take the stage. National Sawdust is an example of a venue purpose-built for a specific niche of music programming. It is, like several of these other specialized, smaller venues, focused on contemporary western art music, otherwise known as “new music,” “legit music,” or “composed music,” depending on the source. Calling it art music might be most accurate, since its creators tend to build across all mediums, walking into a space like National Sawdust and immediately starting to play with all its moving elements while creating a show there. But the venue is not meant to be obtuse for anyone, artist or audience member. As Bureau V’s Peter Zuspan pointed out, National Sawdust not-for-profit founder Kevin Dolan felt that just because the musicians selected to play in the space might be in the “dedicated discovery” segment of modern marketing, patrons “do not have to show their interest in this music through their discomfort.” So it’s not the old-school version of artsy, in other words. It’s far more intimate and enjoyable, and there will even be food served in an attached restaurant. The theatricality and visual art components inherent to many of the works performed at National Sawdust were foundational design factors for the project’s original team at Arup, which included Dave Rife, who has since departed and launched his own creative experiential design endeavor called Dave and Gabe, which as you might guess, is in partnership with Gabe Liberti. “The original idea of black box theaters was to get rid of the room, but we wanted to make this venue really expressive and provide the flexibility to turn the room into whatever you want,” Rife explained. “We’re not trying to cover up the architecture, we’re expressing the architecture. The Chatter performance hall in Albuquerque, NM is dedicated to the performance of neo-classical music. Rife designed the venue from the perspective of an artist in this genre, and in fact, he performed on the venue’s opening night. Designing a smaller venue certainly does require technical flexibility, he noted, but it also puts a fine point on atmospheric fluctuation between intimate performances by small ensembles up through the venue’s other purpose as a recording space capable of housing an orchestra. Built to a PNC 15 rating for recording (a subway line runs one block away from the space), the spring-isolated venue also features acoustic curtains behind its solid panels so it can take on different sonic shapes as well as visual ones. Ultimately the room was built for the multitude of performance styles and talents for performers and other users of National Sawdust’s various production facilities, right down to the relatively boring element of infrastructure. Cabling was provided for a multitude of needs, and there’s plenty of empty conduit for the future. “It’s not as glamorous as room acoustics, but if an artist walks into a space and the infrastructure is ready to go, that has numerous knock-on effects,” Rife commented. Typically, for this type of immersive performance, artists have to spend up to two days getting things connected. But a readymade space gives them more time to simply plug in and focus on atmosphere and cultivating the factors that determine the relationship between the performer and the audience. On the avant side, in terms of contemporary western art music, there is also a small local venue dedicated to the performance of neo-classical music in Albuquerque, NM. A performance outfit called Chatter has taken up the trend of transforming a factory space into a music venue, and modified it for purely acoustic performances. The resulting vibe is one achieved best by small spaces built for one specific style of music. “The space was purposely outfitted just for them,” Winkler noted, “with a lot of listening tests and discussion of how they wanted it to turn out. The space is precisely right. It holds 150 people, and it’s intimate, not stuffy like a concert hall. It’s packed for every show, and they have support from some pretty major donors.” Nationally known artists are playing there, as well. The unifying emphasis across these smaller venues, whether acoustic or with sound reinforcement systems, is to create a beautiful performance venue, Winkler said. “The design of the space itself is a significant factor, how artists and the audience come into a space and are affected by it. The way it looks, how it sounds, how the artists move, that all creates the experience.” And modern audiovisual and PA technology, he concluded, designed and built to provide some control and manipulation by the artists, can help them to provide the best possible experience for the audience. Kirsten Nelson (@kirstennelson) is editor at large for SCN.